The Xbox marks Microsoft's entry into the living room; a place normally reserved for TVs, VCRs and not computers. With the NV2A able to handle DVD output and the 733MHz processor more than fast enough to perform the majority of the MPEG-2 decoding, it's no wonder that the Xbox ships with DVD playback support. The Xbox games themselves are stored on DVD-9 (9GB single sided, double layer) formatted discs and are actually written in a very interesting fashion. The games are written from the outside of the DVD-9 discs to the inside, meaning that most discs will actually have the majority of their data stored around the outer perimeter of the disc. Since the DVD drive in the Xbox is a Constant Angular Velocity (CAV) drive, it can read more data per second off of the outermost tracks making this a highly optimized way of storing data on the DVDs to reduce load times. Obviously the drive can also read regular CDs and DVDs as well. Aside from the faceplate, this is a regular PC DVD-ROM drive. The DVD drive itself is no more than a PC DVD drive capable of reading at 2X off the innermost tracks and 5X off the outermost tracks. Remember that when dealing with DVD drives, 1X = 1250KBps of data which is a little more than what an 8X CD-ROM drive can deliver. With the majority of information stored on the outer portion of the Xbox game DVDs that means that most of the time the drive will be reading at 4 – 5X. Only when dealing with movie DVDs and audio CDs as well as game discs that use the entire 9GB (no game currently meets this requirement) will the drive receive data at the lower speeds. Obviously for movie/audio discs it doesn't matter and it will be a while before games hit 9GB in size (hopefully a very long while). For comparison, the PS2 DVD player is a 4X CAV unit with an inner track speed of around 1 - 2X. DVD-ROM: Power is supplied by the custom connector to the left and you'll recognize the IDE cable to the right. The drive is manufactured by Thomson Multimedia and only deviates from a standard PC DVD-ROM drive in its back panel connectors. Of course there is the standard 40-pin IDE connector which accepts the slave position on the IDE cable going from the motherboard to the hard drive. Instead of a conventional power connector however there is a proprietary 12-pin cable that powers the drive directly from the motherboard. 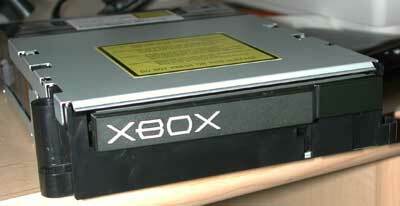 This is the only barrier that stands between you and upgrading the DVD drive in the Xbox to a faster 10X unit. Of course if you want to keep the sleek front look of the Xbox you'll want to open up the replacement DVD drive and swap trays with the Xbox DVD drive. In order to power the drive you could always attach a y-splitter to the power cable going to the hard drive and use that to power the new DVD drive which is adjacent to the hard drive; just some food for thought. Unfortunately in order to enable DVD movie playback Microsoft forces you to purchase their $30 DVD playback kit which consists of nothing more than a remote and an IR receiver for the remote that plugs into a controller port. The quality of the DVD playback is definitely respectable. We compared it to a Sony DVP-NS700P and in interlaced (480i) mode the quality of the Xbox DVD output through component video cables was respectable. True home theater enthusiasts will scoff at the output resolution limitation of the Xbox's DVD playback as it cannot output a 480p or progressive scan DVD movie signal. This isn't because of a hardware limitation rather that it does not support Macrovision in 480p mode. It shouldn't be too hard for a few skilled individuals to get around this limitation however. Compared to the 480p output of the NS700P, the Xbox's DVD output is definitely not as sharp but it is easily competitive with most entry level players. Compared to the initial DVD playback of the Playstation 2, the Xbox is considerably better however we will be upgrading the DVD software on our PS2 unit later this week and performing another comparison to see how things have changed with the latest revision of the DVD software. In the version of the software our PS2 is currently running there are some serious issues with image quality apparently caused by poorly done 3:2 pulldown conversion. The bottom line is that the Xbox's DVD player functions very well as a entry level to mid-range solution but without 480p support is far from a higher end player. We also have a few quibbles with the $30 DVD remote itself. First of all there is no way to remotely power or shut down the Xbox which may be a limitation of the hardware itself. Secondly there is no remote eject button which again may be a limitation of the Xbox hardware. The remote is very easy to use and the display options during the playback of a movie are very easily accessible including a very easy to use zoom feature. 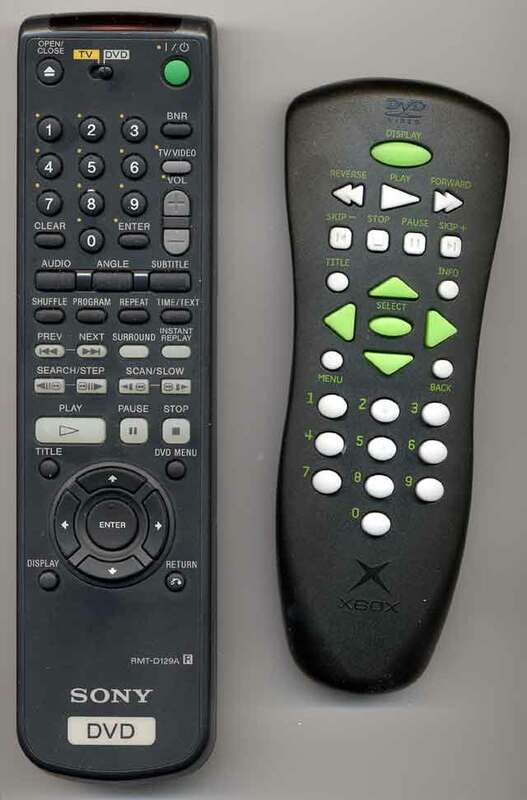 In terms of ease of use the Xbox remote gets an A+ however in terms of features for the DVD savvy user, the Xbox remote falls behind. We'd expect better for one of the more expensive Xbox accessories. It's clear that the remote is made for the mainstream population and not the more savvy home theater enthusiasts.